What is Sokka doing in that third one? He looks like he's wielding an imaginary sword. He is taking cover behind Suki, obviously. 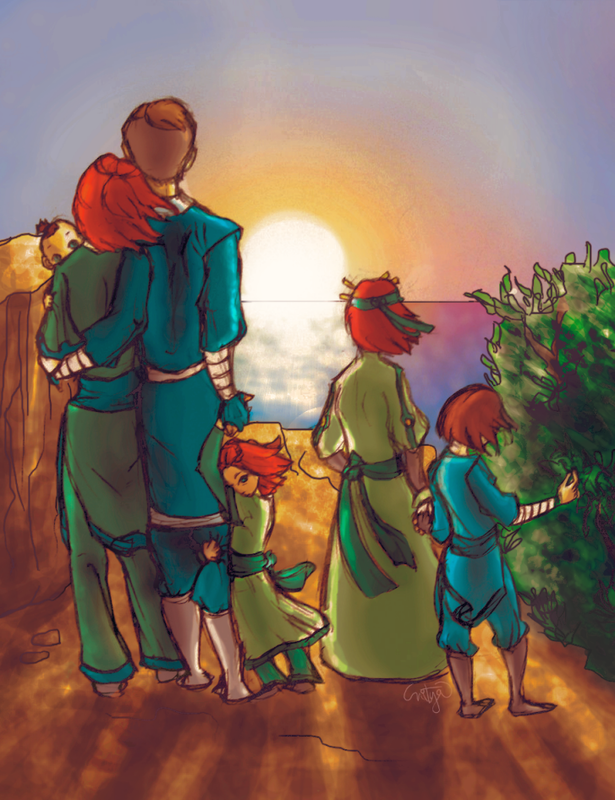 Ah, the Sukka family from Kyoshi-Fan. Good memories. Did Sokka and Suki ever get formally married? I think, at least for these two, the answer can be "no" and yet the picture above could still happen with no angst or falling-out. They definitely did. Sokka was high on the tradition kool-aid and Suki struck me as a character who liked formalities (might be a result of her KW membership). Sorry man but i'm Zuki all the way. But they kind of walked back from that, by the end. Sokka was dating a fighting foreign girl, not a Water Tribe Princess, and Suki was parading around without her makeup teaching boys the secret Kyoshi fighting techniques. They both started as orthodox teenagers and became total hippies as they matured. It's cool, dude, we like crackshipping here. I'm a Maikka girl, myself. For all we know, Suki can be a Water Tribe Princess. She has the blue eyes for it . and Suki was parading around without her makeup teaching boys the secret Kyoshi fighting techniques. Both were under exceptional circumstances. She was teaching the Avatar's self-appointed bodyguard after all, that should be something, and she was running an undercover op when she abandoned her traditional appearance. Suki's bloodline isn't the issue. Sokka doesn't think she's a Princess. And I find the fact that a Kyoshi Warrior is even acknowledging the possibility of an exception for Sokka goes to show that a formal marriage isn't necessary. When it comes to that boy, everything is an exception for Suki. Sokka doesn't think she's a Princess. I dunno but he made the same circles with her than with Yue: cocky flirting -> feeling inferior -> giving in. Either Sokka knows something we don't, or he doesn't make a difference between women of authority. So yeah, even if Suki is not up to a formal marriage, Sokka might be very well still in for that ride. Yeah, I think that's just Sokka's pattern. It proves that there was no romantic possibility in Tokka. For all we know, Suki can be a Water Tribe Princess. She has the blue eyes for it . Actually they changed her eyes to green. I am soliciting Maiko prompts for Maiko Week 2017. Also, there will be a Maiko Week 2017 on tumblr (and presumably spreading outward from there). 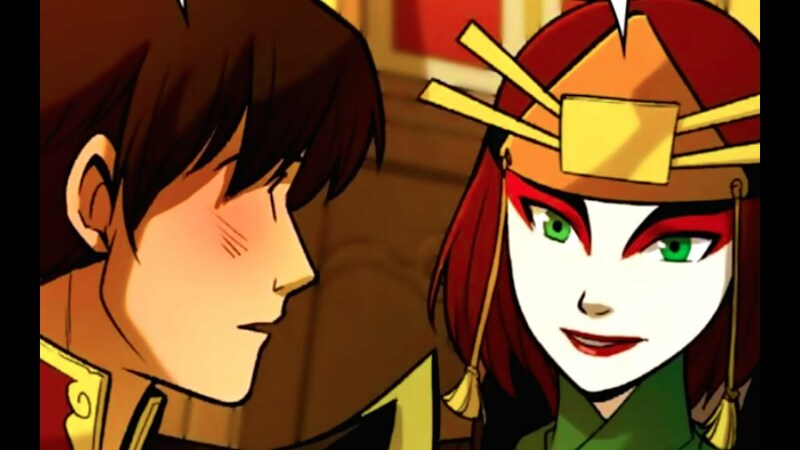 Idk, a part of me thinks that suki is very slowly falling in love with zuko in a way she never did with sokka. I'd love to know how that's actually coming across on Suki's part. Besides, it's not even really Suki. We all know that it's her green-eyed evil twin, Tuki, and it will be revealed later that she's been masquerading all this time under Ozai's orders. She can't beat Avatar Kyoshi's "1008 boyfriends in one lifetime" challenge, but she is traditionally compelled to try. So does this make the couple Tuki-Zuki? Tzuki. The T is silent. We'll let them all the names fight and see which one is left alive at the end. Sutzuki it is! Por que no los tres? The Ty Feens! WILL KEEP I ALIVE FOREVER! I always had a soft-spot for that one. Maybe it makes me a bad Maikoer, but I prefer the idea of Zuko crushing on Ty Lee before his banishment, and everyone but Mai was oblivious, and it was only after Zuko came back from his banishment that was all, "Wow, Ty Lee really filled out but now every time she talks I kind of what to light myself on fire." And Mai would be, "That's called maturity." And inside she's doing a touchdown dance. See people kept treating me like I've always been nuts for legit interpreting Zuko as ace/demisexual or bisexual leaning more towards homosexual. Spends an awful amount of time with dudes, yet he's propositioned by Jin (who had quite lovely assets) and was clueless and had to be pushed along by Iroh and then he's immune to Ty Lee meanwhile every other dude practically explodes in her presence. And his interactions with Mai were always kinda awkward. Cute but awkward. But he was more comfortable around men and characters he viewed platonically (like Toph). And the backstory of Zuko with the abuse from Ozai and taunting from Azula does mirror the struggles faced by LGBT youth. There's many reasons why Zuko (and really both of the Fire Siblings) were the go-to for the Slash pairings.